There has been a bug floating around the Twittersphere recently that is driving a lot of people nuts. It manifests itself in a way that makes it appear as if you are not following an individual on Twitter, even though you are. Updated. Twitter has now acknowledged that the bug exists and that its engineers are working on a fix. The bug is easiest to see if you check your ‘following’ tab and notice one of the individuals in the list has a ‘+ Follow’ button next to their name instead of the ‘Following’ checkmark. The good news is that the bug is actually just visual in nature. 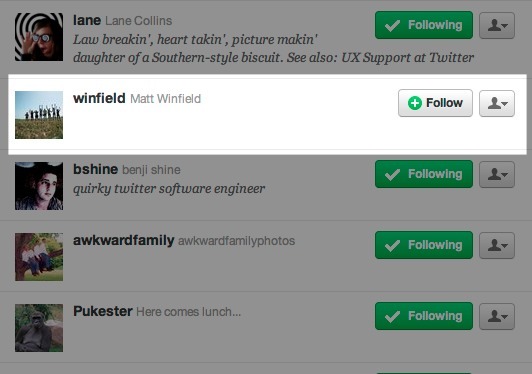 If you click through to the person’s profile, you’ll see that you are still following them. Twitter says that it is hard at work to resolve the problem, but does say that you can help by leaving a comment on this Help Center post with your username, the names of the accounts that are bugged and recent interactions that you’ve had. This would also seem to indicate for the amount of talk I’ve seen about Twitter ‘automatically unfollowing’ people without user permission. Note that the problem isn’t new and has been known about for some months, but we have seen a resurgence in the talk about it recently. P.S. Yes, Twittersphere is a word. Update: Yes, if the button shows that you don’t follow them, and you click it, you’re actually unfollowing them yourself. It’s just a mirage. Unfortunately, that doesn’t stop people thinking that you’ve ditched them and getting offended.